For the eleventh month in a row the Bank of England decided to keep the Official Bank Rate at 0.5%. This is the lowest rates have been even if I look back to the year 1694. 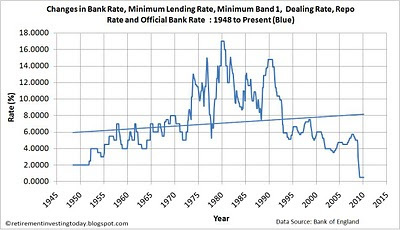 Even during the Great Depression the Bank Rate only went as low as 2%. My first chart today shows the rates going back to 1948 showing just how low the Bank have set rates compared with recent history. Additionally, the Bank also decided to continue with its £200 billion quantitative easing program with £7 billion left to spend. To me it looks as though the Bank of England decided today to punish the prudent and to reward the reckless. Who are the reckless? Well they are those who maxed out on as much credit as they could, whether to buy houses or plasma televisions. Who are prudent? Well they are those who didn’t extend themselves and decided to save for their future. I put myself into this category as I’ve decided to save for my retirement by investing with money I have earned. What makes me think the bank has made this decision? As I’ve already identified previously inflation is starting to take off. 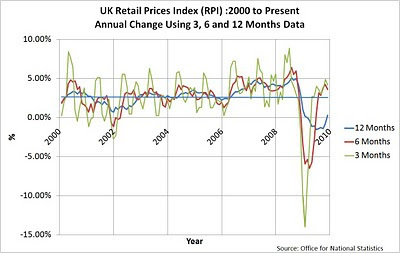 Annualised UK Consumer Price Index (CPI) is currently 1.9% and the UK Retail Price Index (RPI) is currently 0.3%. The second chart however shows the true inflation story. As of November while the 12 month figure is 0.3% (as published by the ONS) disturbingly the 6 month figure is 3.6% and the 3 month figure is 4.1%. By keeping the Bank Rate at record lows, quantitative easing and other factors like the return of VAT to 17.5% can only push inflation higher. I think the Bank has decided to take the inflation route. Allow those with debts to have them magically inflated away while those with assets see them devalued. Why did I decide to take responsibility for my own future?